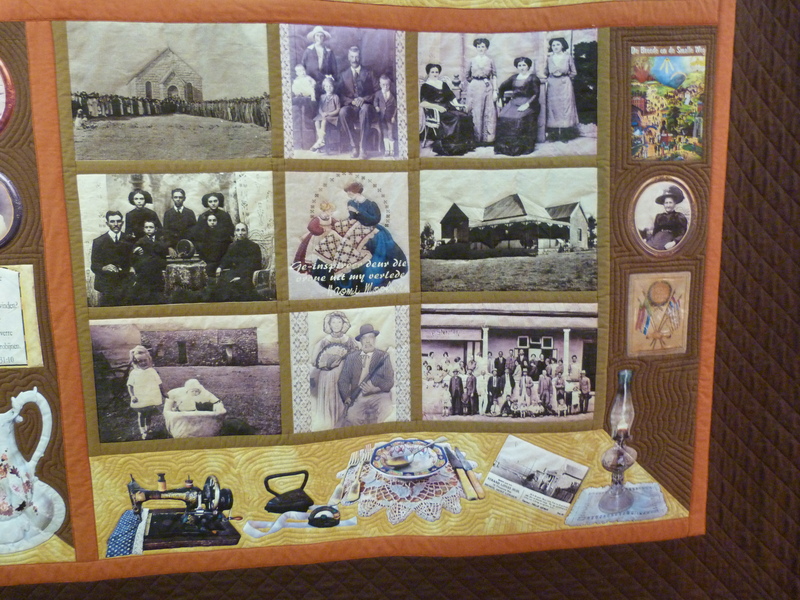 The huge Heritage Quilt of the Boer Republics was on display at the quilt show at Quilt Festival. 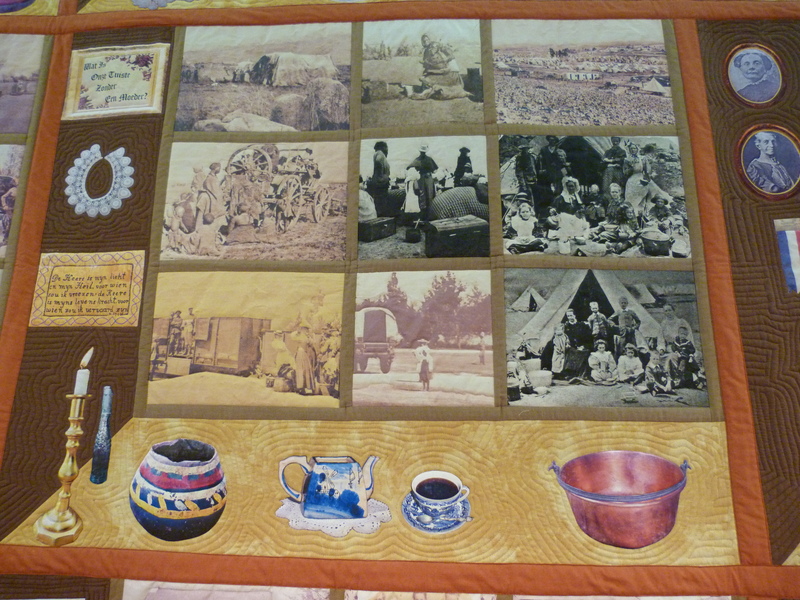 It was made for the National Women’s War Museum located near the War Memorial in Bloemfontein to honor the role and struggles of South African women during early settlements, the Boer War and post-war recovery (1870’s to 1920’s). 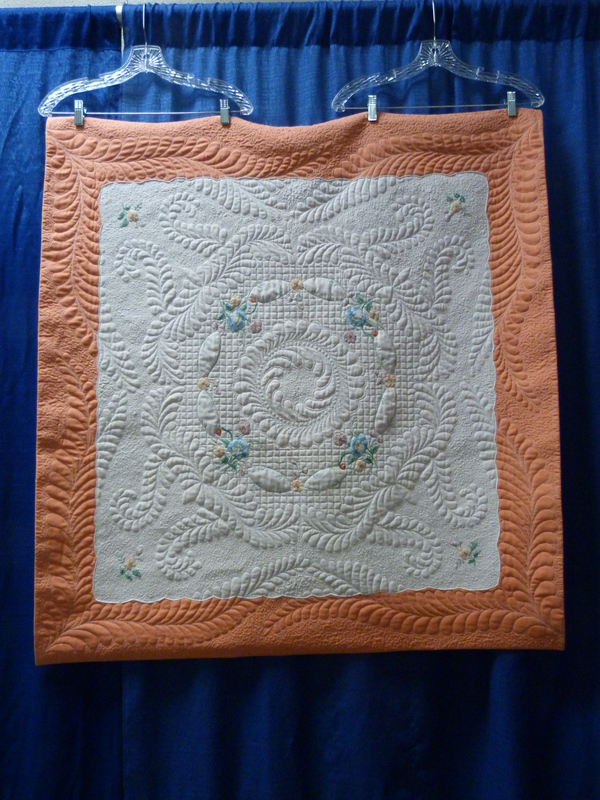 This recently completed quilt, which measures 3 meters x 2.5 meters, was begun in 2010. 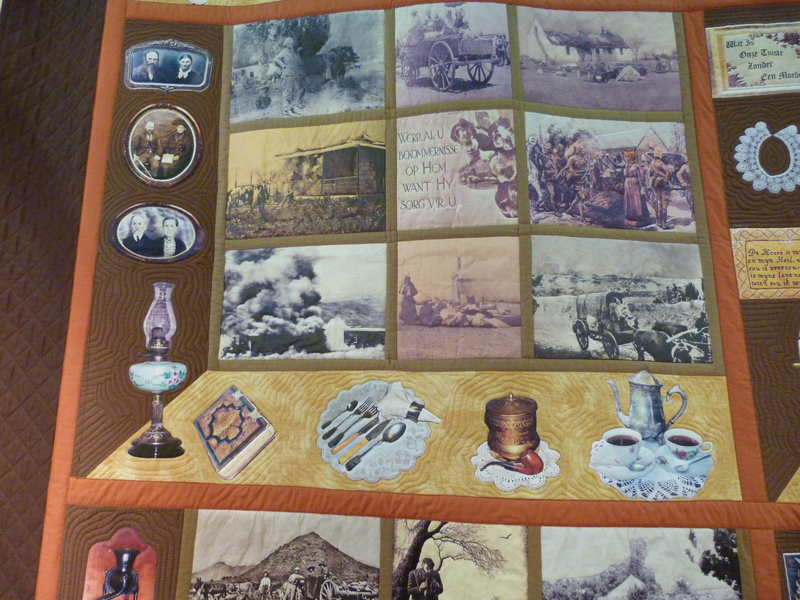 Naomi Moolman (pictured below with the quilt) gathered the historic photographs from the War Museum and from her own collection and had them printed on cotton. 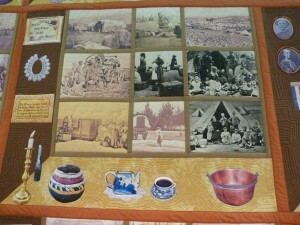 The quilt was pieced and quilted by Petro van Rooyen and Magda Kriek of Pretoria. 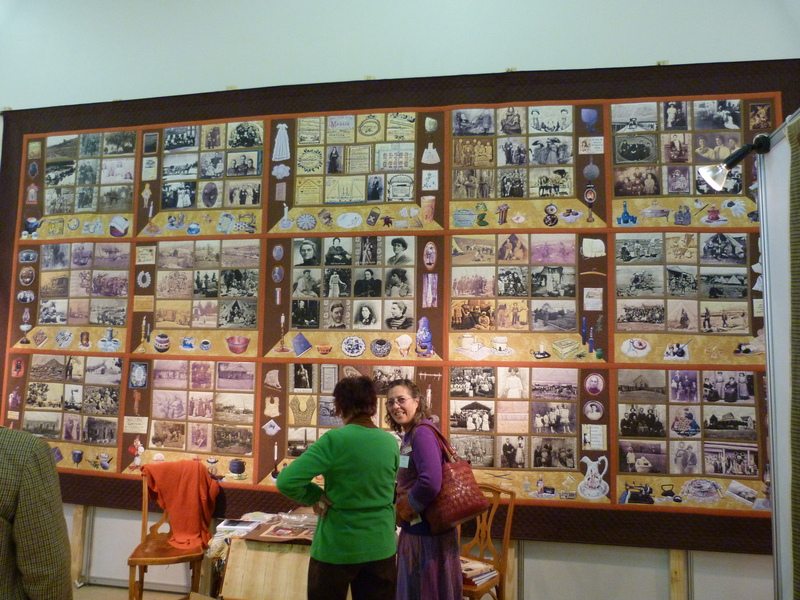 Naomi was at the show every day, sharing this amazing piece and telling stories about the women in the photographs. There are three rows of five attic window blocks. The top row is of family photographs during the last 30 years of the nineteenth century and the second row focuses on the brutal Anglo-Boer war when Boer settlements were burnt and pillaged and women and children were sent to prisoner of war camps (two blocks shown below). 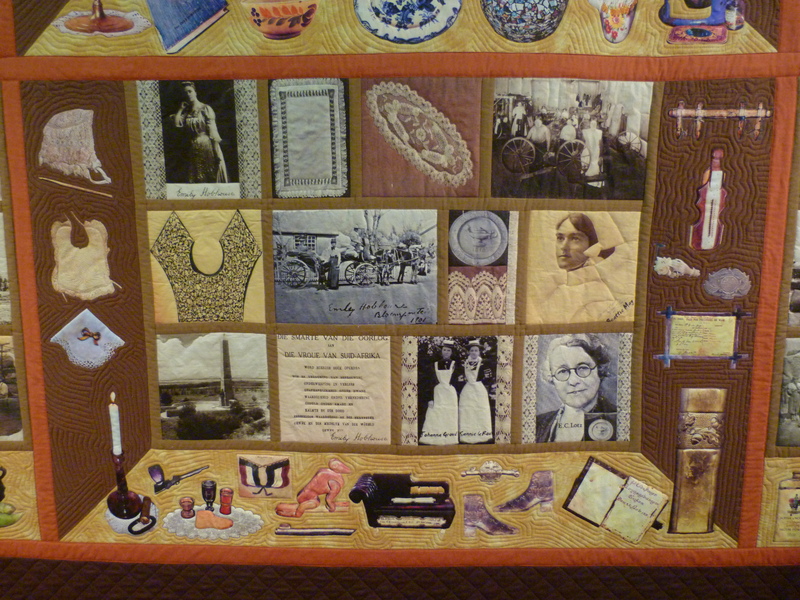 The third row examines the return to homes in the post war period of the 1920’s. 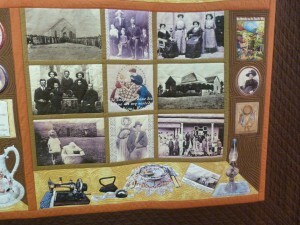 Naomi told us about Elizabeth Lotz who’s photo is in the right hand picture at the bottom right. Elizabeth was a nurse in the Cape Town area. During the Boer War, when she was eight years old, the English came to their farm and shot her father. Her mother was told dig a grave and bury him. Then she and her mother were taken away to a prisoner of war camp. Story has it that she was so angry that she kicked and bit a soldier. 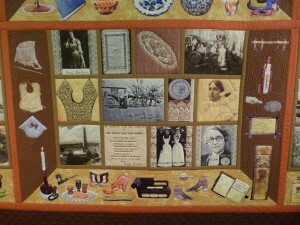 After the war, she trained as a nurse. When she was offered the position of matron, she accepted on the condition that the nurses be allowed to talk to patients in their native tongue and not just in English. She also insisted that nurses should be trained in Afrikaans as well as English, and she got her way. 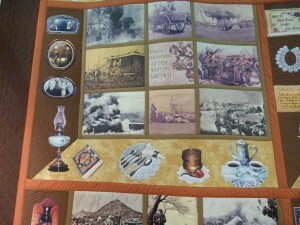 This quilt is an extraordinary testimony to the challenges of every day life and war in a turbulent period of history. My historical knowledge is poor, and this was a wake up call, reminding me how fortunate many of us are to live our comfortable lives without the sorts of struggles that these women endured. 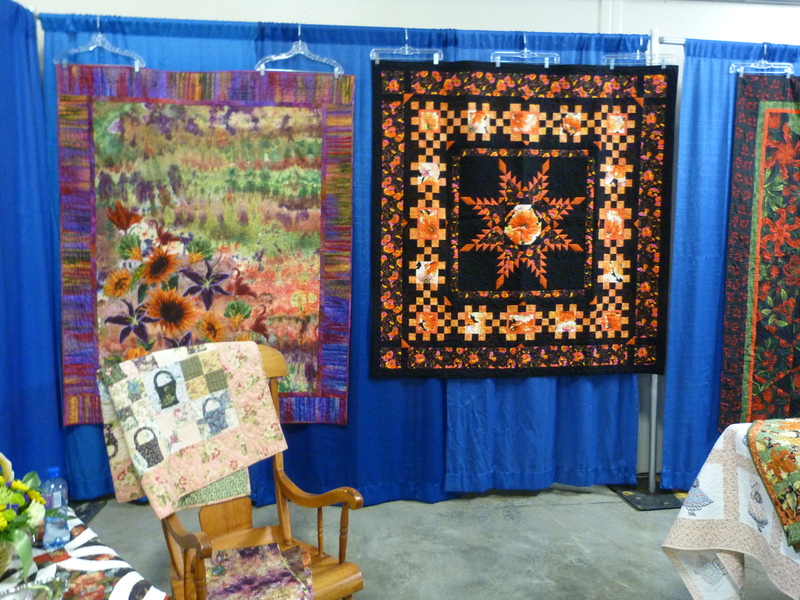 Last weekend my local guild, Kitsap Quilters, held their annual show at the Kitsap Fairgrounds in Silverdale and I enjoyed helping to hang the quilts and working in the kitchen during the show. This was the 28th show and my 22nd with them. 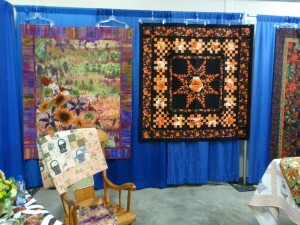 The theme this year was Quilts in Bloom. 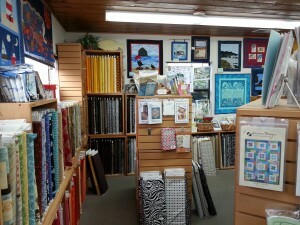 Our guild has around 200 members and embraces a wide range of quilting techniques and styles. 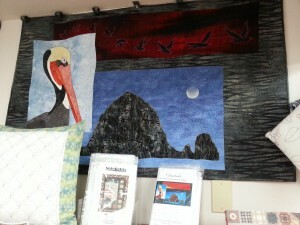 In this blog I’ll share pictures of the work of our featured quilter, Gladys Schulz from Bainbridge Island. 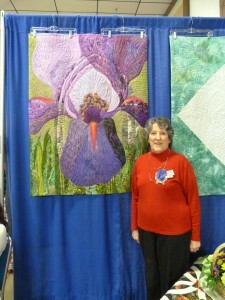 Here is Gladys in her display area with her lovely iris quilt. 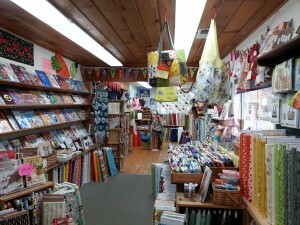 The large scale one-block wonder quilt is vibrant. 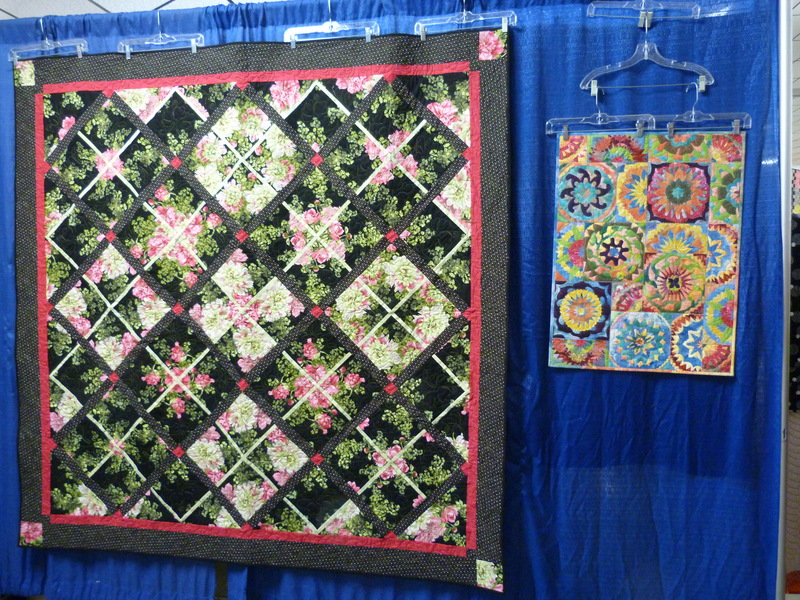 Gladys has been quilting for over fifty years, but seriously so for the last 25. 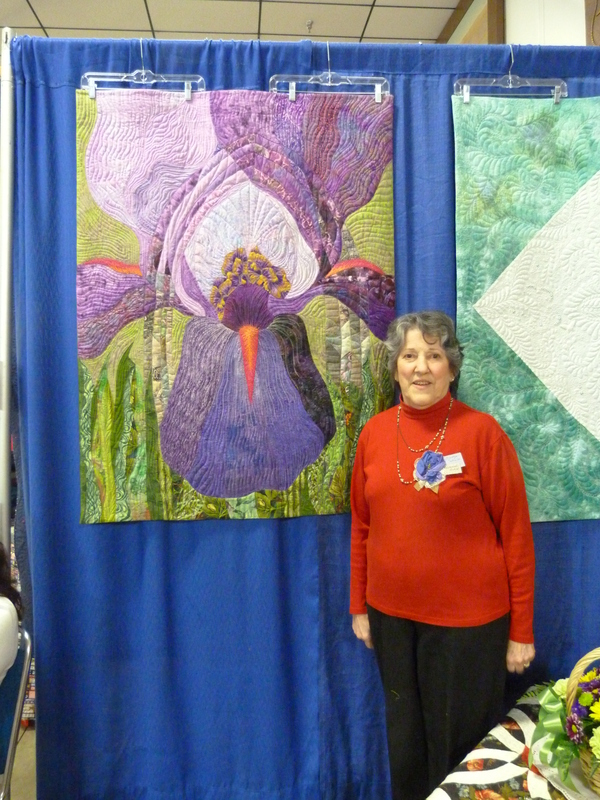 She has a long-arm machine and is prolific in her own work as well as quilting for others. 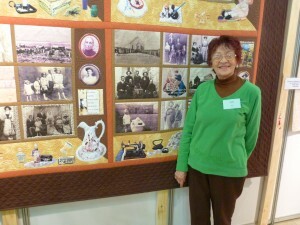 She is incredibly generous, donating many quilts every year to a variety of charities. 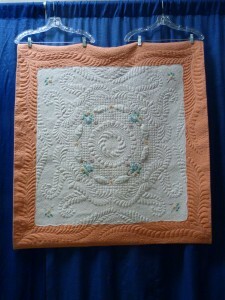 She made the attractive Feathered Star quilt to test my Radiant Feathered Star pattern before I published it. 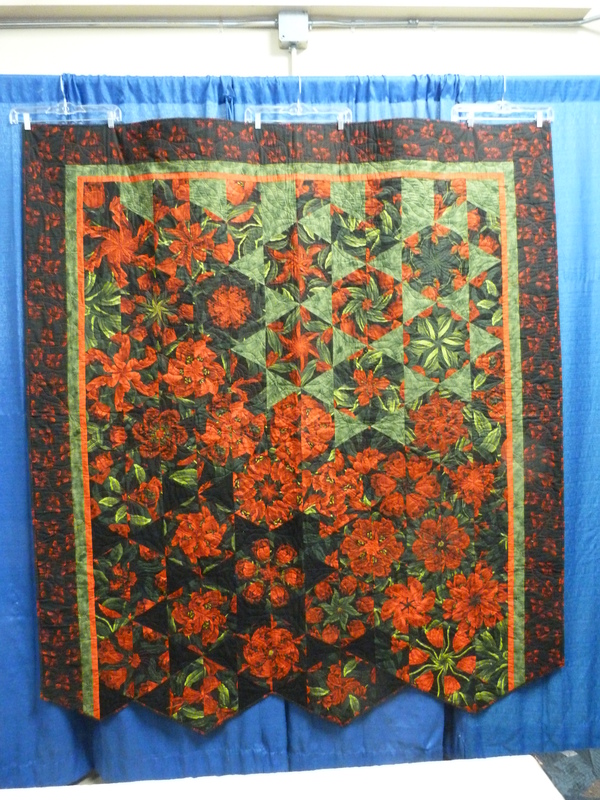 Gladys is an accurate piecer and I knew I could rely on her to pick up any glitches in my pattern and make useful suggestions for improvements. 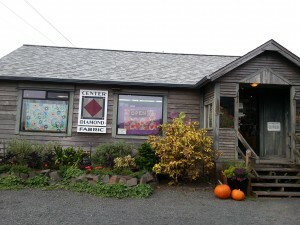 Recently, she has begun ice dyeing fabric. She made the background of the floral quilt using this technique. 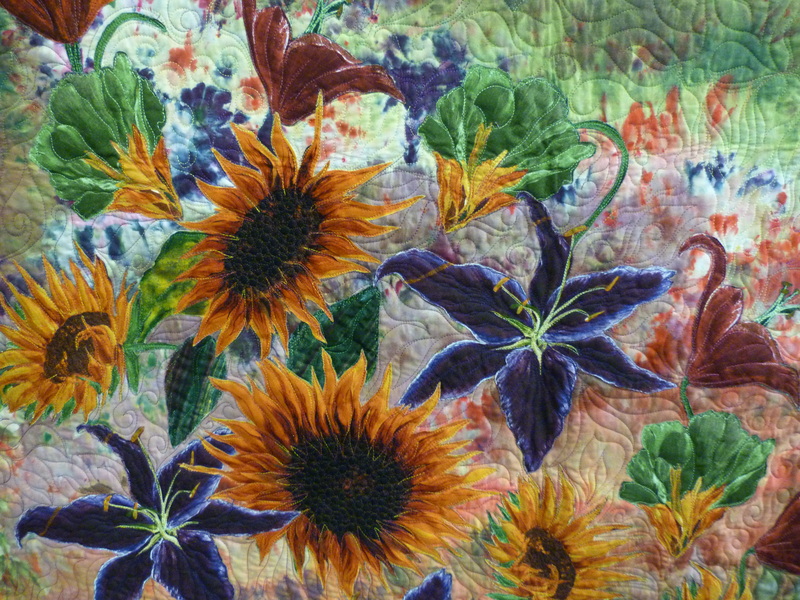 The detailed shot shows how she cut and appliqued flowers onto the hand-dyed background. 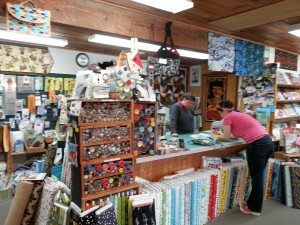 Gladys loves to try new quilting techniques and her machine quilting gets better and better. 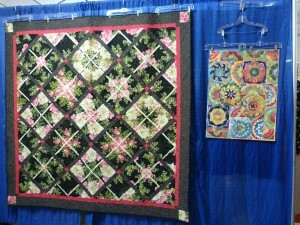 This magnificent quilt really show cases her quilting skills. 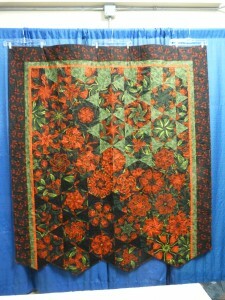 The simple four patch quilt with lattice is so pretty and a great use of the large-scale print. Happy Valentine’s Day! 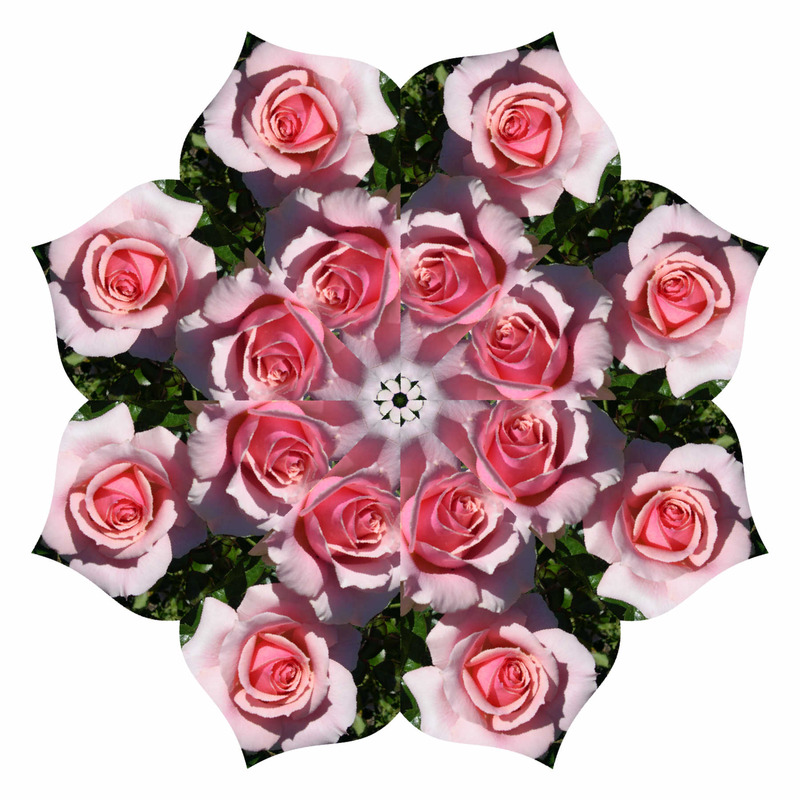 I created this image using one of my roses photos and computer software to make the kaleidoscope. It’s hard to believe that I’ve been writing blogs for a whole year! This is the 80th! 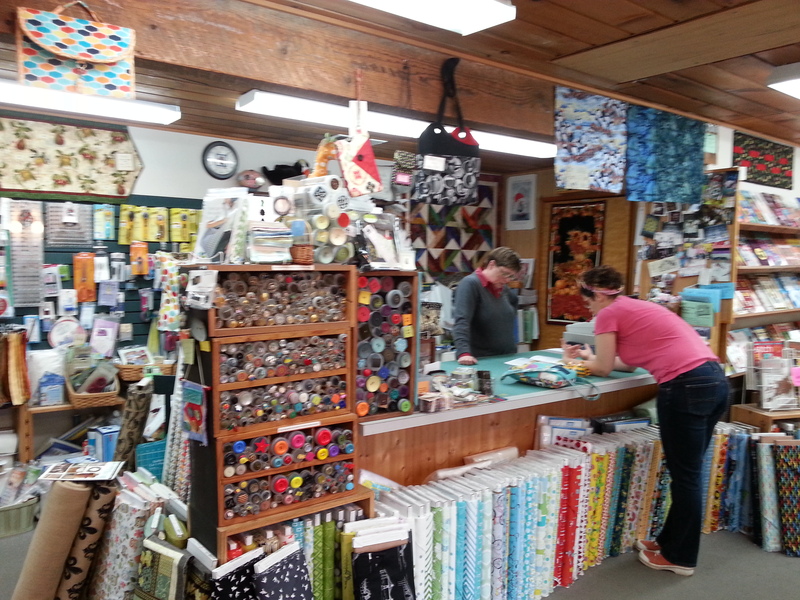 After visiting the quilt shop in Wheeler, Nancy and I continued to drive north to Canon Beach. 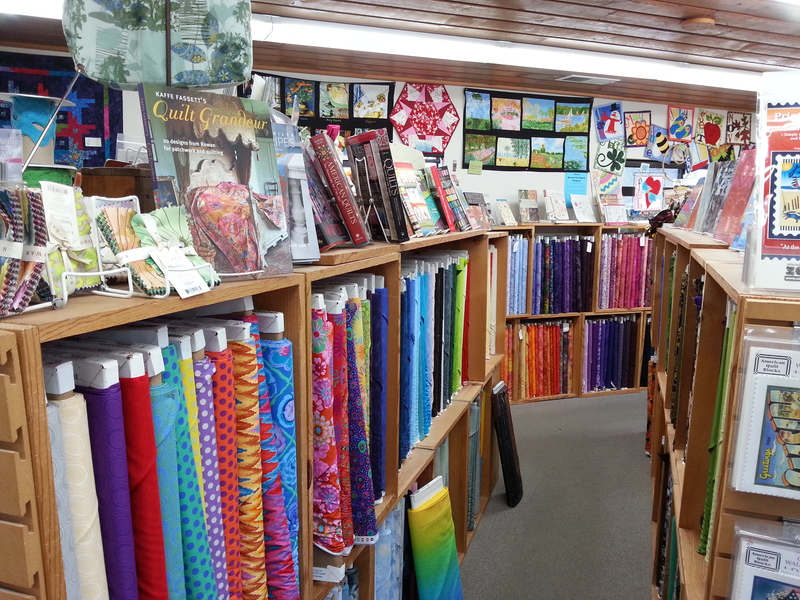 A friend had enthused about the wonderful selection of batiks at the quilt shop there, Center Diamond, and I wasn’t disappointed. 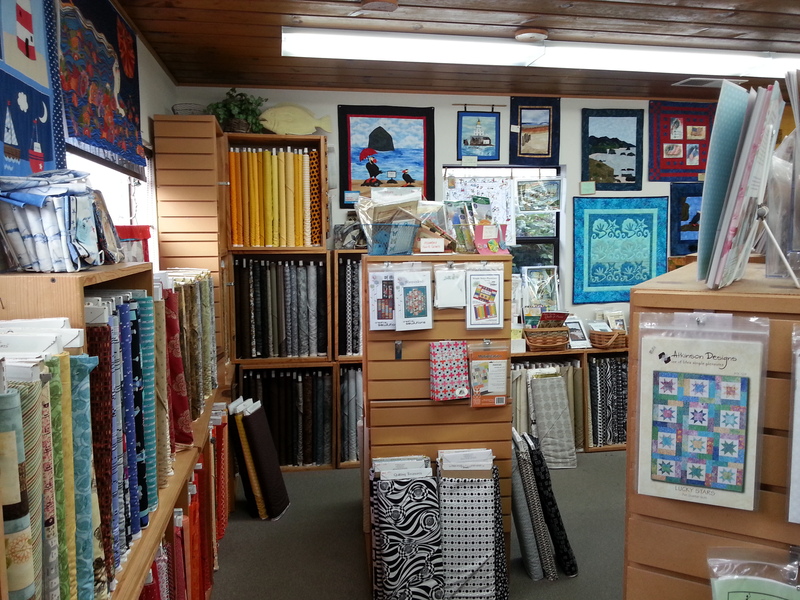 We spent an enjoyable half hour just before closing, perusing the selection of fabrics and feeling inspired. As well as the wide variety of batiks, the store offered many contemporary looking prints and patterns in keeping with the Modern Quilting style. They also had some great patterns reflecting the local surroundings. I love this pelican and Haystack Rock. 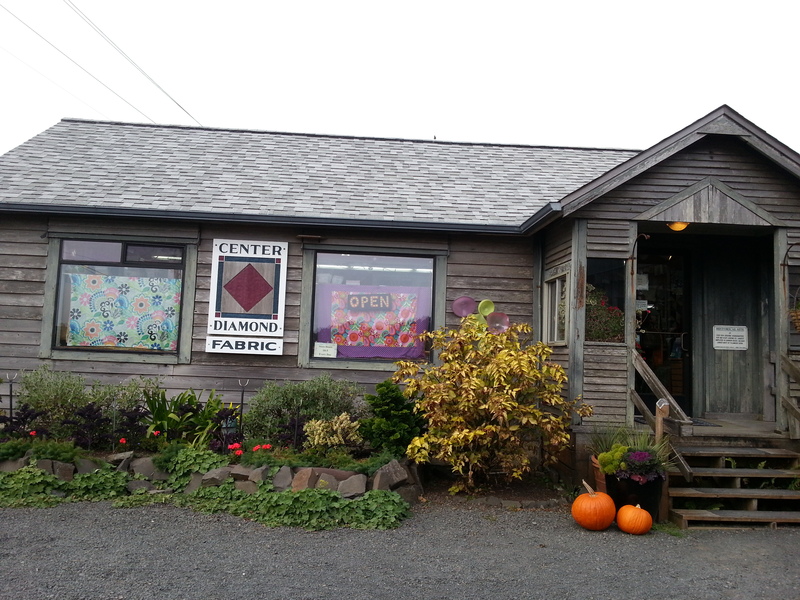 Once again, I was surprised by how much inventory a place that doesn’t appear very large from the outside can offer. This is definitely a fun stopping point if you are in the area.